Telluride, CO-The next time you hike with Ryder-Walker guide Willi Glanznig, don’t be alarmed if he starts jumping from side to side on the trail as if he’s trying to make perfectly synchronized turns. He’s just sneaking in some off-season training. When he’s not leading hiking tours with Ryder-Walker Alpine Adventures, Willi makes figure eight turns on the snow, and it’s something that he does well. 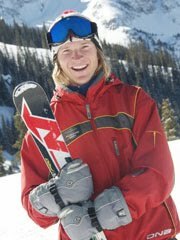 Proving that his off-season jumping helps on the snow, Willi took first place at the U.S. Powder 8 Championships held this past weekend in Aspen, Colorado. What’s more, this marks the second time that Willi grabbed the coveted crown at the U.S.A. Powder 8. Willi and his partner Dieter Frank won the championship, also held in Aspen, back in 2006. The U.S. Powder 8 Championship is an annual two-day competition that scores two-person ski teams on their ability to make perfect figure eight turns on the snow. Day one is an elimination round held on groomed runs, while day two carries the remaining teams into the ungroomed back bowls of the Rocky Mountains. Once in the backcountry, the teams descend with each skier crossing their teammate’s tracks in effort to make perfectly shaped figure eight turns. Judges score each team on the synchronization of their turns, dynamic skiing, and roundness/symmetry/line of descent. Making ski turns may sound easy, but skiing in perfect harmony with a partner takes a lot of experience, training and concentration, something that Willi has been perfecting since he first started skiing at the age of three. Fortunately, for Willi and his teammate Steve Cieciuch, all that experience paid off. (With a little trail jumping on the side). Congrats to Willi and Steve! Visit the USA Powder 8 Championship website for full results and more info.